Figure 1. Average Trap Catches for Ontario for 2014-2018. 2018 data in for up to Week of July 16 to 22nd. If ever there was a year to get out and scout before making a management decision, it is this year. Western bean cutworm trap catches have been much lower than previous years (Figure 1). Yes, many saw significant increase this past week, but they are still not at levels we would normally see during this time period. 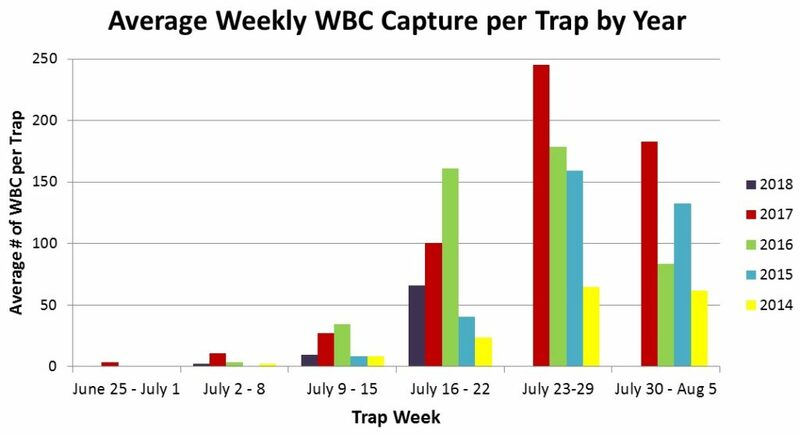 Based on the WBC Trap Network data for Week 8 (July 16 to 23), Chatham-Kent, Elgin and Oxford experienced the biggest trap catches last week (Figure 2), though numbers are still not as high as they were in 2016 or 2017. Peak flight is likely taking place for Chatham-Kent, Lambton, Elgin, Middlesex, Oxford, Huron and Haldimand/Norfolk this week (Week 9). Essex may already have experienced peak flight last week (Week 8) and avoided much of the risk. Traps in all other counties east and north of those in Figure 2 are likely not peaking until the Week 10 or 11 (July 30-Aug 5). Trap catches are so low in these other regions I am starting to wonder if they will see WBC this year. Figure 2. 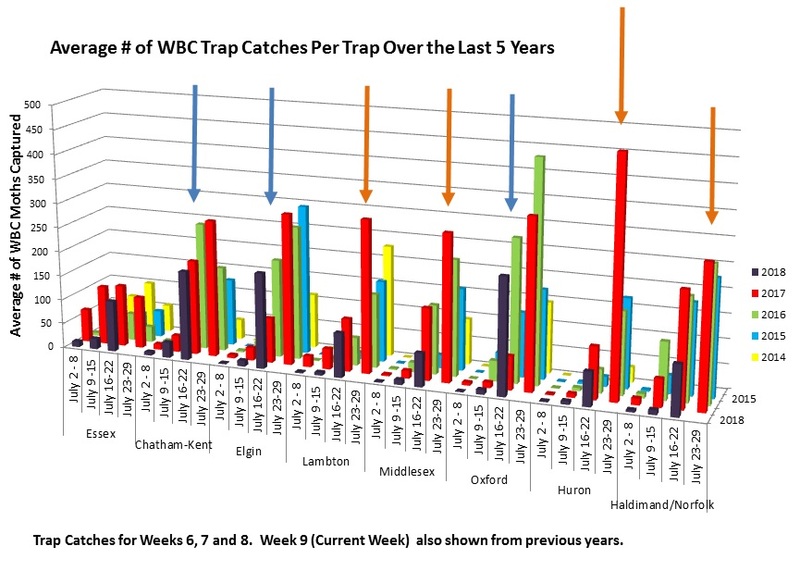 Weekly Trap Catches for Counties in SW ON. These counties are always the first to experience peak flight. Blue arrows indicate those counties that saw the biggest catches last week. Orange arrows also indicate those that should also peak this week. So what does this all mean? Later planted fields that are still in pre-tassel to full tassel stage should be the focus for scouting over the next two weeks. Many experienced scouts, including myself, have yet to find egg masses in their fields. Some fields have reached threshold but they are not as common as in previous years. Spraying, just in case, does not make sense this year. Even if your trap catches were to jump significantly in the next two weeks, don’t assume that WBC is laying eggs in your field. 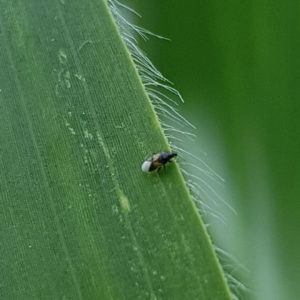 WBC is really only attracted to pre-tassel to full tassel corn so any fields that are already in fresh silk stage have likely avoided most of the egg laying. And there are so many more natural enemies in the fields this year that are ready and waiting for WBC to show up on their plant. Spraying, just in case, is detrimental to them. 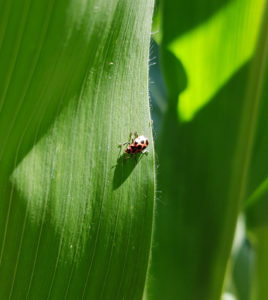 Ladybugs are abundant this year in corn and dry beans. 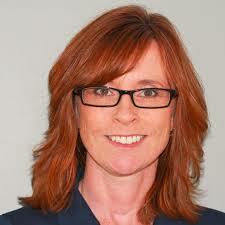 Dry bean growers should still follow the recommendations provided here. But I encourage you to consider leaving check strips since this year, a spray might not pay off if moth flights remain low in general. Especially fields east and north of Oxford. Make sure you are not confusing stink bug eggs for western bean cutworm eggs. 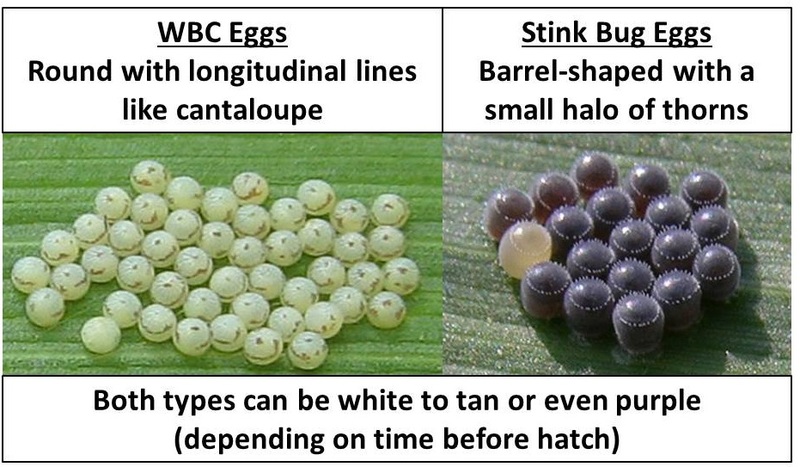 WBC eggs are round while stink bug eggs are barrel (or marshmallow, if you prefer) shaped.